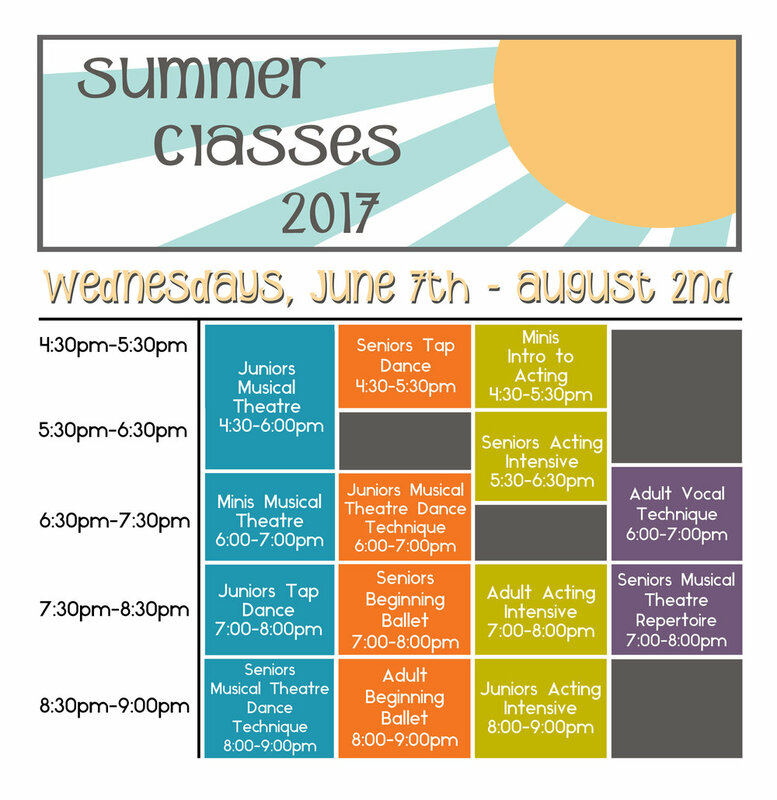 GCPA summer classes provide the perfect opportunity to continue your performing arts training! Be prepared for fall auditions and classes. Stay in shape this summer by continuing your training in all disciplines! Check out our Take 3 and Take 4 options for Juniors, Seniors, and Adults. CLICK HERE to register for Juniors Take 3. CLICK HERE to register for Juniors Take 4. Seniors Take 3 - CLOSED. Seniors Take 4 - CLOSED. CLICK HERE to register for Adults Take 3. This class is designed to teach the basic technique and skills needed to master standard musical theatre dance moves. Combining ballet technique with style, students will gain strength, balance, and coordination that will then be applied to combinations from a variety of Broadway musicals. With an emphasis on character and story telling, students will learn to not only execute dances but also move and entertain their audience. This is an open level class for beginning and intermediate dancers. This class is designed to introduce and develop the basics of Musical Theatre Tap Dance. Through warm ups, students will learn to articulate the feet in basic rhythms and patterns. Progression and combinations will teach basic tap steps that are common in the musical theatre tap vocabulary with a strong focus on body position and posture. This is an open level class for beginning and intermediate dancers. Learn the fundamentals of ballet technique in this beginning level course including class etiquette, beginning level terminology and positions, proper alignment, and musicality. Students in this class will learn the fundamentals of acting technique, including stage directions, navigating a script. character development, and collaborating with scene partners. Group games and activities will help young actors learn to physicalize different characters and stories and work together to tell a cohesive and interesting story. Bring your imagination and we'll help you unleash it on the stage! Acting is more than just memorizing lines. It is using the knowledge we have about human personalities and behavior to make words on a page come to life. In this class, students will begin learning how to approach a script and understand the importance of specific vocal and physical choices in the telling of a story. This class will cover a history of musical theatre and its many genres and vocal stylings. Students will learn to choose repertoire suited to their voices from different Broadway eras and develop song interpretation and presentation. This class provides an excellent opportunity to expand your music portfolio and receive coaching on musical theatre pieces for auditions, recitals, and performances. This is a great introduction to vocal coaching for the untrained singer. Learn the fundamentals of good vocal technique including best practices for breathing, diction, and posture. Develop your music reading abilities as well as improve your ear training. Students will apply the technique they learn to songs in the musical theatre repertoire, also practicing good choral techniques including blending and harmony.